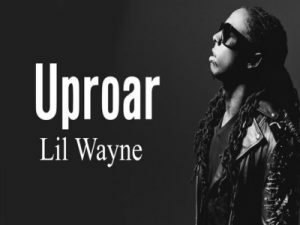 “Uproar” is a song by American rapper Lil Wayne featuring fellow American producer Swizz Beatz. Young Money Entertainment, Republic Records and Universal Music Group released it to rhythmic radio on October 5, 2018, as the lead single from Wayne’s twelfth studio album, Tha Carter V.
The instrumental, produced by Swizz Beatz and Avenue, is a recreation of G-Dep’s 2001 single “Special Delivery.” Wayne previously remixed G-Dep’s song on the Dedication 4 track “Green Ranger,” which features J. Cole. Ironically, on “Green Ranger,” Wayne stated that he didn’t even like this beat.